The 2017 American Liberty 225th Anniversary Silver Four-Medal Set contains four examples of the American Liberty medal, which replicates the design seen on the 2017 American Liberty High-Relief $100 Gold Coin. The silver medal is a non-monetized, more affordable counterpart to the historic American Liberty 24-karat gold coin; the 2017 American Liberty $100 piece is the first United States coin to portray a distinctly African American representation of Miss Liberty. On the obverse of each 2017 American Liberty medal is the common Miss Liberty bust, which faces left. Miss Liberty dons a broad headband with large stars. Also on the obverse is a "1792-2017" dual-dated element and the inscription "LIBERTY." The obverse design is provided by Justin Kunz and sculpted by Phebe Hemphill. The reverse of the American Liberty medals showcase a powerful eagle in flight. The inscription "United States of America" is seen above the eagle while the mintmark is seen to the lower left of the reverse. The reverse was designed by Chris Costello and engraved by Michael Gaudioso. The four-medal set gives collectors the opportunity to own the popular 2017 American Liberty medal in a variety of finishes that showcase the artistic beauty of the piece and the versatility of modern minting techniques. 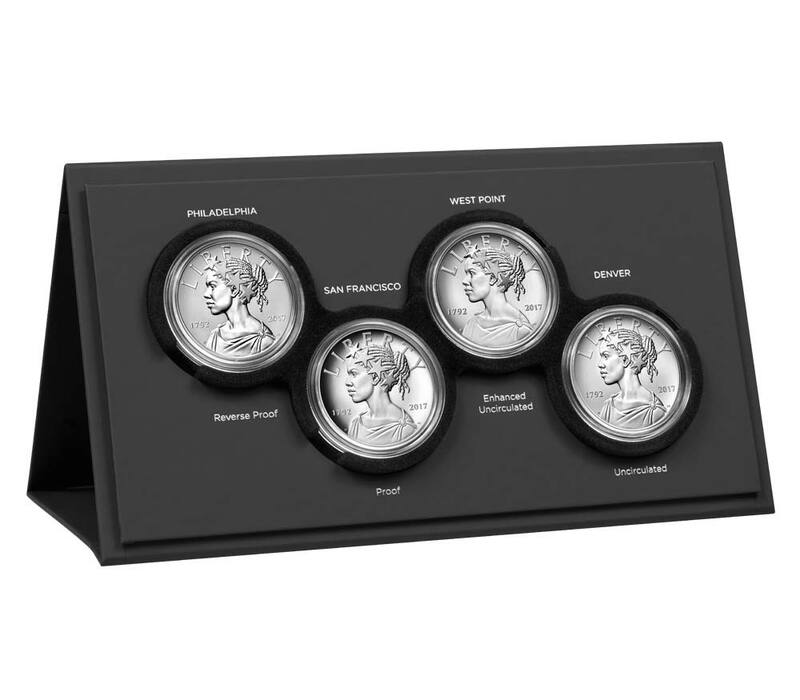 Each of the medals in the four-piece set is made from a 99.9% silver composition, and they are packaged in a display case along with a mini-book that narrates the history of the artistry in representing Miss Liberty on United States coinage over the last 225 years. As of November 2017, the issue price for the American Liberty four-piece medal set is $199.95. However, the price could potentially increase or decrease if silver bullion values dramatically change. The United States Mint is authorized to produce up to 50,000 sets, and there are no household ordering limits. Whether or not the medal set is a sellout remains to be seen. However, given the widespread press coverage of the 2017 American Liberty $100 gold coin earlier in 2017 and the relative affordability of this medal set, there could be a run on remaining units during this holiday season.